A recent set of UK postage stamps will be of interest to "Prisoner" fans, as Beachy Head lighthouse ("Many Happy Returns" and "The Girl Who Was Death") is the subject of one of the stamps in the "Scenes of Britain" series. 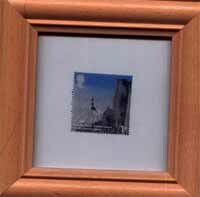 To raise money for a planned 2007 "Prisoner Seminar" event, fan Leslie Glen has several framed and mounted Beachy Head stamps for sale, pictured left, at £5 (plus P&P). Click HERE and send an email if you're interested. With thanks to Leslie Glen for this news item.